It can be a pain to know when and how often you can water your lawn during water restrictions, but residents of at least one North Texas city seem to have a handle on conservation. 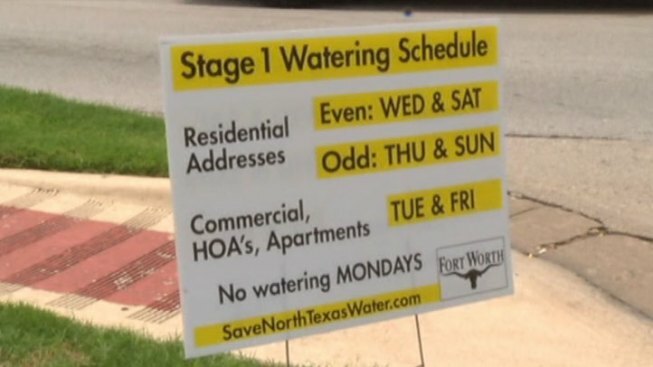 Fort Worth residents appear have been well aware of when they could and couldn't water during the first month of Stage 1 water restrictions. "The word continues to get out," Fort Worth Water Department spokeswoman Mary Gugliuzza said. "People continue to understand what their responsibilities are." In fact, the water department saw 30 percent fewer watering violations in June 2013 compared to the first month of Stage 1 restrictions in 2011. "Most of the violations were for watering on the wrong day," Gugliuzza said. Of the 1,289 total violations in June, 1,009 were for watering on the wrong day. Water on hard surfaces such as driveways netted 86 violations, while 38 customers were caught wasting water and 32 had broken sprinklers. Five others watered while it was raining, which is also a violation. All of the violators received warning notices, but only three received greater notice. No one is facing a system lockout or fine just yet. Water use was down 7.4 percent in June 2013 compared to June 2012. It's a sign that residents are taking the conservation idea seriously, which "is encouraging," Gugliuzza said. Not only are more people following the water restrictions, but a recent survey done by the water department shows that a vast majority of users would like to see those restrictions go year round, regardless of drought. "Sixty-nine percent favor a permanent twice-a-week strategy as a conservation measure," Kara Shuror, assistant water director, said at Tuesday's City Council meeting. A Tarrant Regional Water Department survey also showed 69 percent are in favor of making the twice-per-week restriction permanent. Gugliuzza said it's something the city would continue to look at but, with restrictions already in place, there's no need to make them permanent at this point. City officials just hopeful the first month's conservation and rule-following continues. "We hope it continues," Gugliuzza said. Violators are given a week to fix problems. But continued violations could lead to fines of up to $2,000 per day. For more information on the water restrictions, click here.